25" x 19" Giclee print on fine art canvas with archival inks. 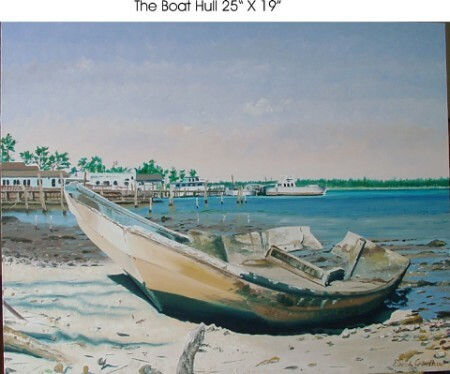 Each limited edition print is hand signed and numbered by Cape Fear area artist. Double thick stretchers gallery wrap does not require framing. Contemporary look and shipped ready to hang. Originally from Atlanta, Georgia, Derick Crenshaw moved to Wilmington, NC, in 1984, and considers the coast his home. Committed to his art as soon as he could hold a pencil, Derick had his exhibition debut as early as the 5th Grade. At the age of 17, he was invited to show at the prestigious Piedmont Arts Festival in Atlanta, Georgia. At 19, Derick was featured in a one-man exhibit at the University of Georgia in Athens, Georgia. He was educated in Advertising Design and earned the title of Master Pictorial Artist. His illustration career and success spans over twenty years, earning numerous regional and national awards, including "Best in Show" in regional Addy Award Competition and "Gold" in the national Addy Awards. After completing a number of commissioned portraits and paintings, Derick left the world of advertising illustration to paint his magic for the world. Derick worked as a Scenic Artist for DEG Film Studios and was a member of the Cape Fear Filmmakers’ Accord. He has shown successfully in juried shows in the southeast. His work hangs in many private and corporate collections. Derick now paints a variety of subjects, but favors human form and figure in a natural setting-what he refers to as "peopled landscapes." He considers his style of painting to be "contemporary realism." Derick has a way of catching a moment in the lives of his subjects, revealing the character of people as they go about their daily lives.